Dave Smeds: I loved fiction from an early age. I was particularly drawn to stories of imaginary worlds, or at least by settings that were in effect imaginary, such as Mars as depicted by Edgar Rice Burroughs. At age fifteen, it occurred to me I might be able to write a short story or two. I did that. The result was crap, of course, but every time I did another story or fragment of a novel, I could see how to improve. (It was, as you might imagine, REALLY OBVIOUS how I could improve.) I felt driven to eventually write something at a level I’d want to read if someone else had written it. DS: There is a great deal of me in “The Wind’s Kiss.” The fulfillment I feel in being a father. The contemplation of the pioneer life led by my ancestors as they moved westward, often literally dwelling right at the edge of civilization, first settlers on the scene. The vital need in our hearts for passion between, and admiration of, one’s lover. However, there is also a more specific inspiration for this particular piece. In August, 2016, I was finally able to take a journey through Nebraska. For the first time in my life, and quite possibly for the last time, I visited the grave of my great great grandmother, Marancy Alexander Warner. The land there has a windswept, deeply conscious aspect. I wanted to install that presence in my fiction as soon as possible, and as it happened, that sort of setting and mood was perfect for what I wanted to write for Lace and Blade 4. DS: In the early days, I never thought of myself as deeply influenced by any particular author, except perhaps in the sense that I loved to write sword-and-sorcery, and back then, anyone doing that was standing on the shoulders of Robert E. Howard and J.R.R. Tolkien. In retrospect, I see L. Frank Baum’s influence upon the way I structure a story. Baum did not write The Hero’s Journey. He wrote The Heroine’s Journey. That is to say, he wrote books in which the protagonist — usually a girl — makes alliances, as opposed to the Campbell paradigm where a young man pulls himself up by the bootstraps, stands alone, and takes sole credit for defeating an antagonist. I prefer the complexity and subtlety of The Heroine’s Journey. DS: At first I wrote to prove I could do it. Next I wrote to earn money. Both motivations, in my view, demanded that I write the best work I could, so in that respect, I have no regrets. But I write now with the awareness that an author of fiction has an obligation to inject meaning into an essentially meaningless universe. That’s our job as human beings. We are creatures of pattern recognition. It’s our chief survival trait. But a fiction writer must do it better than anyone. Hard to do. However, at this point in my life I’ve proven I can write many types of fiction and I’m at a point where I don’t need the money, really, so what keeps me putting the words down on the chance it will move a reader in a way that would not have happened otherwise. As said, hard to do. I try anyway. DS: My process would drive any other writer nuts, I suspect. The ideas — whether it is for a scene, a character, a setting, a plot, a premise — bubble up and I go with what fascinates me at the moment. I see the whole story as a piece and fill in the pieces almost randomly as if assembling a jigsaw puzzle. I might write the ending first. I might write a little bit that fits two-thirds of the way along. Often I will start at the beginning, but it’s just about unheard of that I proceed from page one to the end in chronological order. I think that’s happened only three or four times in forty-seven years of writing, and only with very short pieces. DS: In terms of output, I’ve slowed down tremendously in the past fifteen years. Lately quite a bit of my creative work has been on the art side of my career, doing covers of other authors’ books. 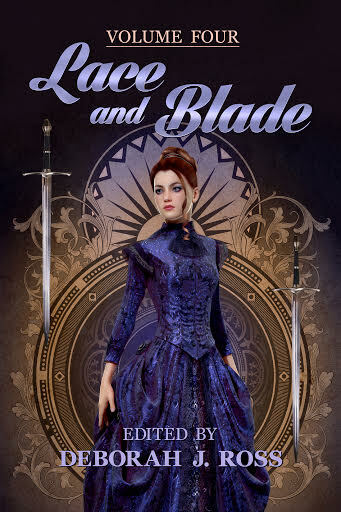 For example, I did the cover for Lace and Blade 4. 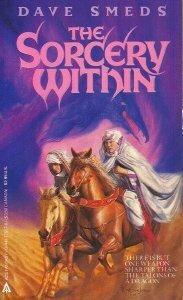 Since 2006, aside from reprints and adaptations, my fiction has appeared in either the Lace and Blade series or the Sword and Sorceress series. Of those, I’ve been absent from only two volumes, namely Lace and Blade 2 and Sword and Sorceress 30, and I did the cover for the latter. I plan to get back to doing spec short fiction for a variety of markets now that I’m at last on the verge of completing The Wizard’s Nemesis, the final volume of my War of the Dragons trilogy. DS: Forget about it. Quit right now. I don’t want any more competition. Dave Smeds has authored novels, short fiction, comic book scripts, and screenplays in a variety of genres including science fiction, contemporary fantasy, superhero, martial arts, horror, and erotica, but he is particularly at home when writing imaginary-world fantasy, as in his books The Sorcery Within and The Schemes of Dragons and his stories in over a dozen volumes of Sword and Sorceress. "The Wind's Kiss" is another such work, set entirely in a world of its own; however, the premise and the themes and the images are very much drawn from a personal wellspring, including his experience of being a father. The setting is directly inspired by a 2016 visit he made to the site of the pioneer homestead on the Nebraska prairie where his great great grandmother, Marancy Warner, finished her life. As he stood at her grave -- unmarked, but Dave knew where it was -- a breeze stirred.